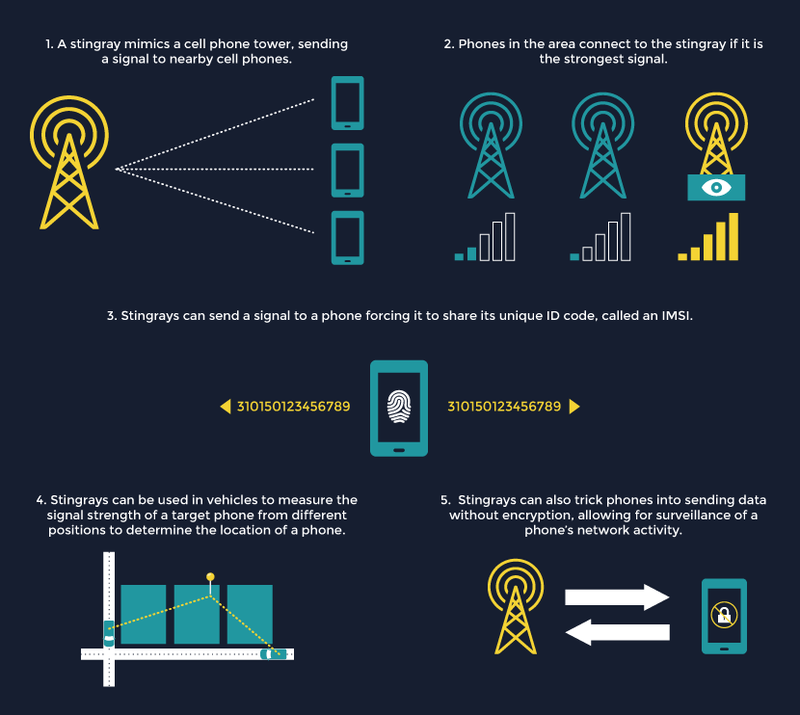 Stingray Tracking Devices, also known as “cell site simulators” or “IMSI catchers,” are invasive cell phone surveillance devices that mimic cell phone towers. They send out signals to trick cell phones in the area into transmitting their locations and personal identifying information. Stingray devices can be incredibly helpful to law enforcement, especially when they are trying to track down a suspect. When they can locate a suspect’s cell phone, it helps Officers gather information about that person, but it can also pickup information from the cell phones of random persons nearby. Law enforcement agencies all over the country use Stingrays. They can be used in vehicles to measure the signal strength of a target phone from different positions to determine the location of a phone. They can also trick phones into sending data without encryption, allowing for surveillance of a phone’s network activity. And in some cases, these devices might even be capable of delivering malicious spyware or software to personal devices. But is the government being transparent about the use of these powerful tools? The ACLU has uncovered evidence that federal and local law enforcement agencies are actively trying to conceal their use from public scrutiny, and they are continuing to push for transparency and reform. In 2018, the ACLU reported that 75 agencies in 27 states and the District of Columbia, own stingrays. Some of those agencies include the Federal Bureau of Investigations, U.S. Secret Service, Immigrations and Customs, Internal Revenue Service, and many more. However, many agencies continue to cover their use of stingrays in secrecy.